Olde Green Cupboard Designs: Look What I Made! Gosh... 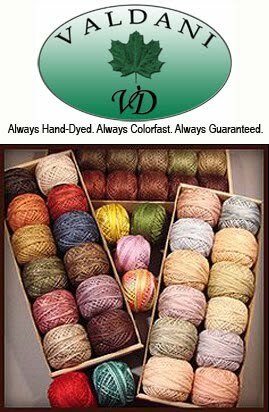 I haven't posted since it was my Friday on the Marcus Friends & Companion Sew a Long.... I've been crazy busy... getting things made for door prizes! Yes... we have another Camp Blanding retreat at the end of this month and I have 100 door prizes to make so we can give them to the attendees! I've made some cute things... (sure hope they like them) ! 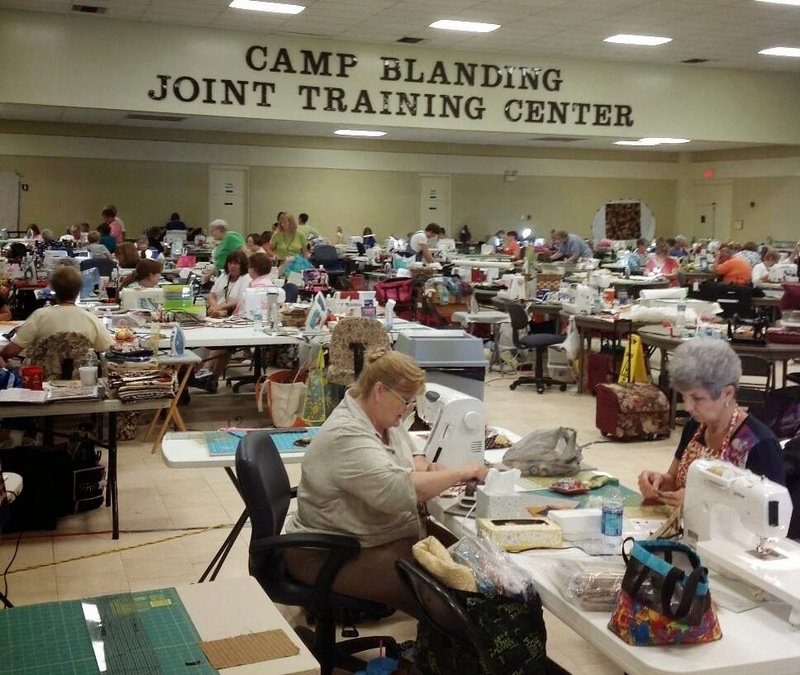 Camp Blanding is such a treat.... a room full of women (and sometimes several fellows) sewing their little hearts out. Well... we're not all sewing... I've seen knitting, rug hooking, cross-stitch, embroidery, basket weaving, doll making, oh yes... and we do quilt too!!! It's just a wonderful time... I love walking around the room to see what everyone is working on. I tell myself... "self, just look, do not pick up any more ideas of things to make"... Well! We all know how good that statement was! Here they are... it's not a very good picture... but you get the idea. You fussy cut (with a clear plastic template) fabric and they end up into these awesome stars with great patterns on them. Look what cool idea I had!! One of the "hookin' gals" (as in RUG hooking) found these great cloth envelopes at Walmart in the Back-To-School section. They even snap closed. I had forgotten all about them until I ran in the store the other day and whipped by the school supplies. Well... that silly light bulb popped above my head and I had to find them. OMG!!! They had tons of them! I had such a difficult time picking out the pattern and colors I wanted. Well... here's one that I made with the red/cream pin stripped fabric! 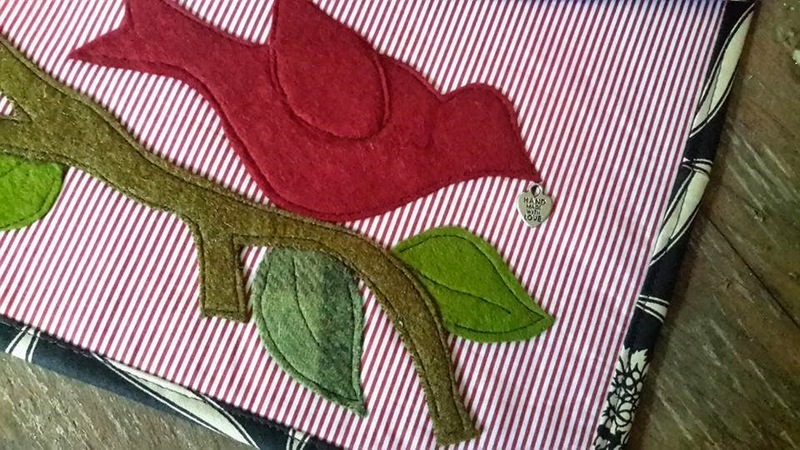 I simply sketched out a bird, leaves, and limb... and did a little applique out of wool. Then added a binding! I will be making more of these and selling them on my website! They measure 9" x 13". I just think they are perfect for so many things... (they have a soft lining) projects... small rulers, hand work... GREAT for gifts for your FRIENDS! So... keep watching my website and you'll see some soon. I'm working on different options for you to all choose from. Don't you just love the little charm in the birdies mouth "Hand made with LOVE". Our fabric is coming along..."Farmhouse Blooms" I've worked on three different patterns.... take a peak at the first one.... it's called "Buttons & Bows". I'm going to add a small button to the center of each bow!! This design (once pieced and quilted) will look VERY FARMHOUSE "worn"... like an old vintage quilt. (Heather and I made this sample board for Marcus... If they like this design they will show it at the Houston Market! However, if they choose one of my other designs... I can make this into a pattern! Vicky and I cannot wait to get our hands on the fabric... it should be arriving late November - early December! Farmhouse Blooms will ship early in the year (2015) for spring!! Okay...now I need to get busy! 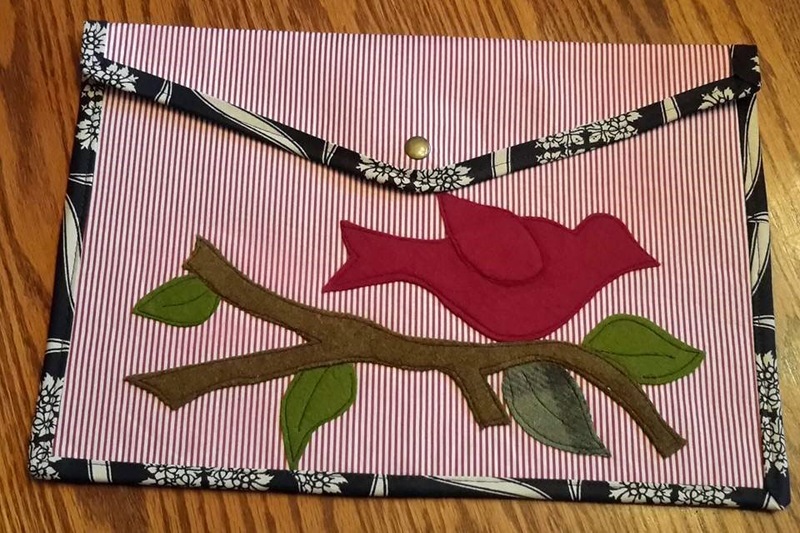 Let me know what you think of the wool applique envelopes and this pattern! Your feedback is the best tool I have when designing!